Considering the number of times I've heard it, AGP 8X is certainly the new catch phrase when it comes to motherboards and videocards these days. Since SiS and ATI both enjoy the 8X AGP spotlight it would be a little naive to expect Nvidia to sit back and stay out of the party. Nope, Nvidia went back to the drawing board and tweaked both the NV17 (GeForce4 MX) and NV25 (GeForce4 Ti) GPU's to enable 8X AGP compatibility. Today we will be reviewing the Prolink PixelView GeForce4 MX440-8X; the videocard uses the new tweaked NV18 (MX440, 8X AGP compatible) GPU, and is backed up by 128MB of TSOP-II 3.6ns Samsung DRAM. Prolink is targeting the gamer on a budget with the PixelView GeForce4 MX440-8X because the card is probably one of the fastest GeForce4 MX's out there. 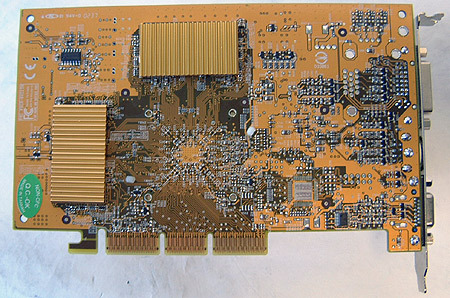 Prolink clocks the core of their card at a full 300 MHz up from the 270 MHz most other MX440/MX440-8X's are clocked at. The memory is clocked at an amazing 550 MHz, again up from the usual 400 MHz of most other MX440/MX440-8X's! The PixelView GF4 MX440-8X has a rather impressive cooling solution which covers both the memory and the core with a large extruded heatsink. On the back, there a two small Ramsinks attached with frag tape. 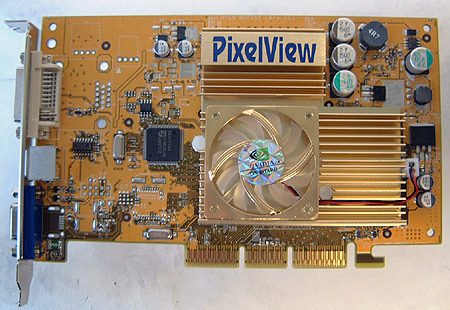 On the I/O side, the Pixelview is equipped with an analog port, S-Video VIVO module and a DVI connector. It's nice to see that Prolink has taken the liberty of including everything that a person would need to fully take advantage of their videocard. They throw in a DVI to analog converter, S-Video to Composite cable, VIVO module and a S-Video to S-Video cable and to top things off, the software package is pretty impressive as well. There are two games; Codename: Outbreak and Ballistics. Also bundled is WinDVD 4 Software, PowerDirector and the Driver CD. The users manual is small, but to the point.